Trim beef chuck eye roast and cut into 1 1/2-inch pieces. 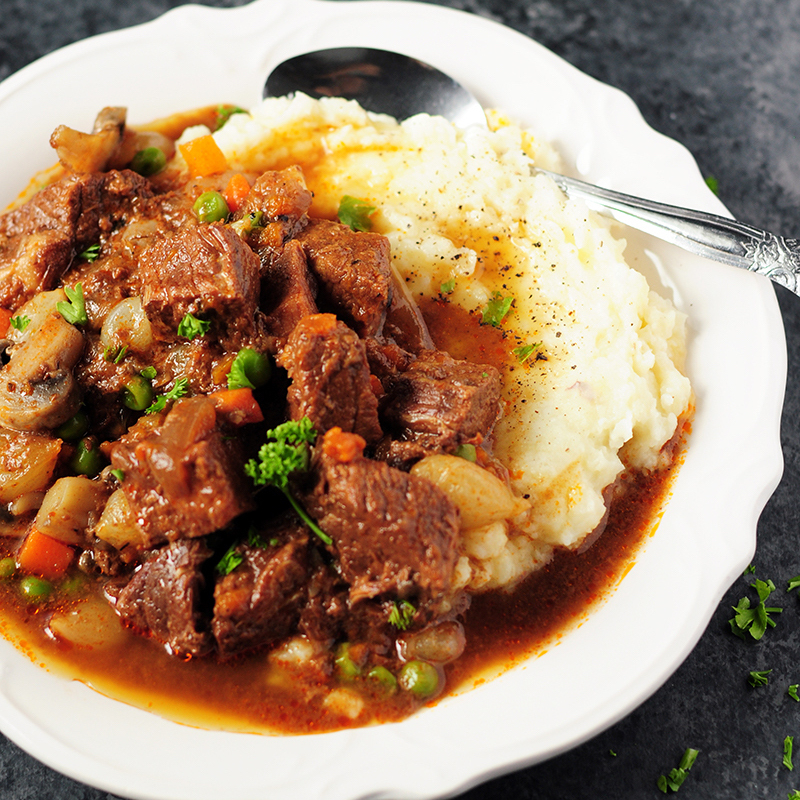 Place the prepared beef in a 6-quart slow cooker. Season with salt and pepper. Cook bacon in a large nonstick skillet over medium heat until crisp, about 8 minutes. Transfer the bacon to a plate lined with paper towel, leaving the fat in the skillet. Refrigerate the bacon until serving time. Pour off all but 2 tablespoons of the bacon fat in the skillet. Add onions, carrot, tomato paste, sugar, garlic, thyme and a pinch of salt. Cook over medium-high heat until the vegetables are softened and lightly browned, about 10-12 minutes. Sprinkle flour all over the vegetables, stirring to coat. Stir in wine, scraping up any browned bits, bring to a simmer, and cook to allow the alcohol evaporates, 10-12 minutes. Pour the mixture over the beef in the slow cooker. Stir in chicken bone broth, soy sauce and bay leaves until evenly combined. Cover and cook on low for 9-11 hours or on high for 5-7 hours, until meat is tender. About 30 minutes before serving, add frozen pearl onions, mushrooms, and sweet peas in the slow cooker. When the cooking is done, let the cooking liquid settle for 5 minutes, then remove as much fat as possible from the surface using a large spoon. Remove the bay leaves. Taste and season with salt and pepper if desired. Reheat the bacon in a microwave on high power for 30 minutes. 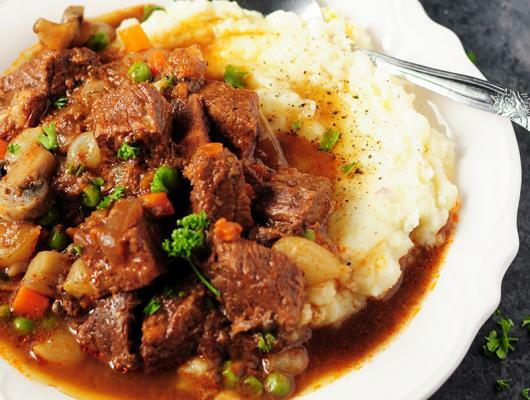 Serve the beef burgundy over mashed potatoes and sprinkle individual portions with the bacon. Garnish with chopped parsley. For a weeknight meal, this savory and scrumptious beef burgundy can be easily put together in a slow cooker to simplify the process!